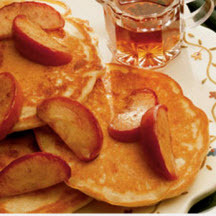 CooksRecipes has quality, kitchen-tested recipes for pancakes, made with a variety of cheeses, that you can count on for successful deliciousness. 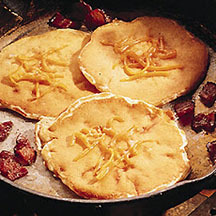 Swiss cheese adds a nutty piquant taste, plus a nice toothsome texture and protein to pancakes. Here's a warm, hearty breakfast to serve up on a cold autumn or winter's morning—or anytime of the year! 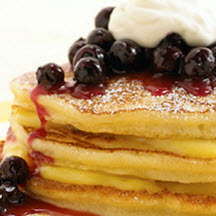 A warm, citrus-infused blueberry compote perfectly complements these tender and delicious lemon pancakes. Recipe by Chef Mindy Segal.